This list of Pilgrimage Site are the Verso Ministries Top Pilgrimage Sites in Region 4. The Regions that will be used for all of our lists are based off of the Regions used by the National Federation for Catholic Youth Ministry (NFCYM) and used for the Bishop Conferences. These resources are here for Youth Groups, Young Adults, and Individuals to be able to find local sites to go on Pilgrimage to. 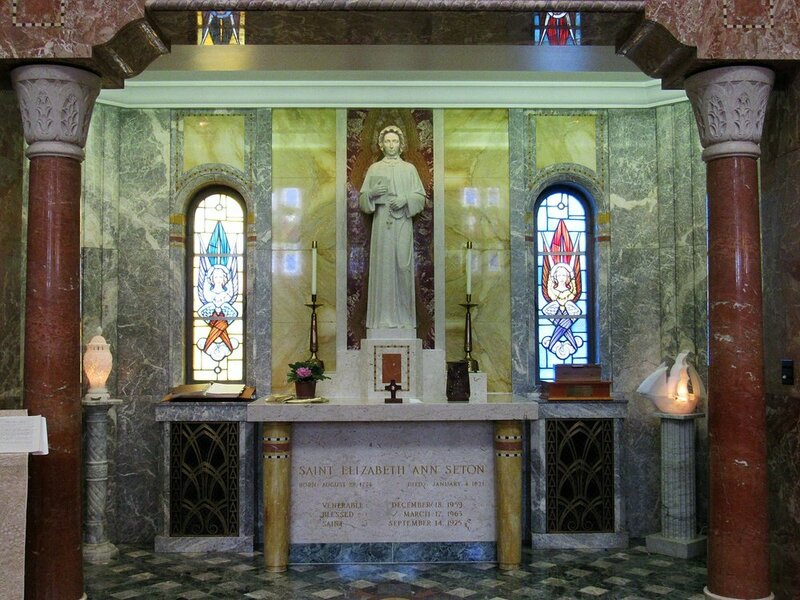 The National Shrine of Elizabeth Ann Seton was created in honor of the First American-born Saint. Saint Elizabeth Ann Seton became a widow and a single mother of 5 at the young age of 29 before converting to the Catholic faith a year later. After her conversion, Seton felt a calling to begin a Religious Order which she named the Sisters of Charity as they took up the ministry of education. Your visit to these hallowed grounds will always be a source of spiritual grace as you walk the same paths trodden by our first homegrown Saint and our first Order founded in this country. The history of our Church in America flows deeply within this region as the heart of American Catholicism seems to have settled here. You can find Saint Elizabeth Ann Seton’s holy life told here both in the museum that tells her story and the sense of her presence around the grounds. It is a beautiful encounter with the woman that inspired so many great Americans in their faith and links our Church today to our past in ways that stick with you the rest of your life. You can easily turn any visit into a Retreat or Pilgrimage with the help of the Shrine’s staff by going to their website and setting up a plan to take yourself or a group to visit the Shrine to experience the Grace that flows from it! Visited by over a million pilgrims a year, the Basilica of the National Shrine of the Immaculate Conception is The Church (yes, capital “T”) of the United States. Seriously, the National Shrine is the national and patronal Catholic Church in the United States. It was built in the 20th century to honor the Virgin Mary as the Immaculate Conception, who is the principal patroness of the U.S. Inside, you’ll find over 70 chapels dedicated to Mary, and they were each donated and decorated by various countries and cultures from around the world. You’ll find chapels dedicated to Our Lady of Guadalupe (Mexico), Our Lady of Czestochowa (Poland), Our Lady of La Vang (Vietnam), Our Lady of Vailankanni (India), and Our Lady of Ta’ Pinu (Malta), just to name a few. You can easily spend a day or two discovering all the hidden nooks and crannies in this beautiful church. And probably most infamous of all – the apse mosaic (the mosaic in the main church behind the altar) is affectionately known as “angry Jesus”. Seriously, you can’t miss Him. Let us know whether you like the mosaic or not! 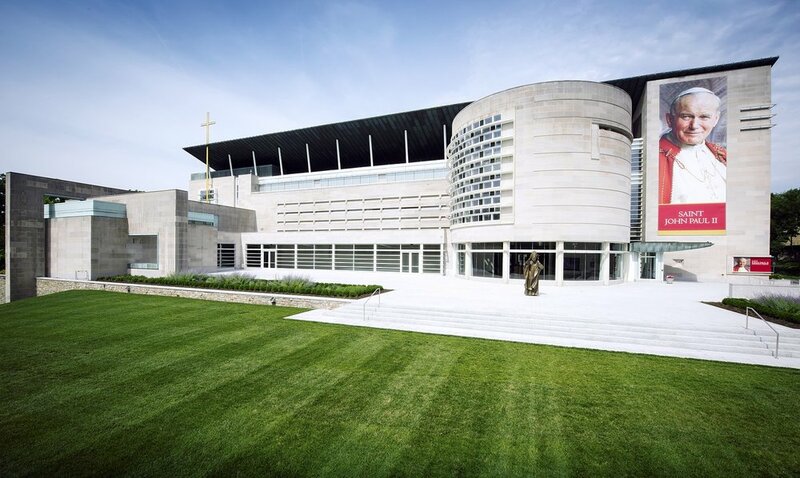 Finished in 2014 and sponsored by the Knights of Columbus, the Saint John Paul II Shrine is an amazing testament to the life and ministry of Pope John Paul II. Inside you’ll find stunning mosaics done by Rev. Marko Rupnik, S.J. in the two chapels. Mass is celebrated in the Redemptor Hominis Church, and you can venerate a first-class relic of JPII in the Luminous Mysteries Chapel. There’s also a well-done museum in the basement with some cool artifacts from JPII’s life. It’s located just across the street from the Catholic University of America and just a short walk (ten minutes max) from the Basilica of the National Shrine of the Immaculate Conception (the one above!). Inside one of America’s finest art museums, the National Gallery of Art, you’ll find a treasure trove of religious artwork from the Byzantine period up until today. Some of the National Gallery’s most-acclaimed pieces are religious in nature. They include Jan van Eyck’s “The Annuncation,” Fra Angelico and Fra Filippo Lippi’s “The Adoration of the Magi”, and Raphael’s “The Alba Madonna”. Lest you think all of the religious artwork is old, don’t forget to check out the modern wing for a completely different take on the Stations of the Cross at Barnett Newman’s “In the Tower” exhibition. Seriously, we highly recommend it! Finally, to encounter the artwork as a pilgrimage try to pray through the galleries. Walk slowly, take your time, and pray with the artwork as it was meant to be used – as a window to the sacred. The National Shrine of Saint Alphonsus Liguori is a holy site ran by the Priestly Fraternity of Saint Peter in honor of a great Saint of the Church. The Founder of the Redemptorists, Saint Alphonsus is also honored in the Church as one of the Doctors of the Church due to his prolific writings. The Shrine itself is home to some of the most beautiful stained glass in all of Maryland and is a Church that leaves all who enter it in a state of awe. There are Devotions that follow Daily Mass every day of the week with the exception of Tuesday and Thursday and the spirituality of the Fraternity that runs the Shrine can be seen through this. The Masses themselves are Traditional Latin Masses and these speak to a time gone by as all pilgrims who visit for these Masses are able to experience the prayer of the Mass in the same way that Saint Alphonsus would have experienced it. In this way you can unite yourself to this great Saint and look to have your life influenced by his. Being at the heart of downtown Baltimore, you have so many great opportunities for places to visit after seeing the Shrine! In fact, you are even only a few blocks from the Saint Jude Shrine (512 W Saratoga St, Baltimore, MD 21201) so you could even make a double pilgrimage out of the trip! You are also only a short drive from the harbor and the Aquarium so this is a great site for you to stop by with your family or friends while you enjoy a day out in Baltimore!